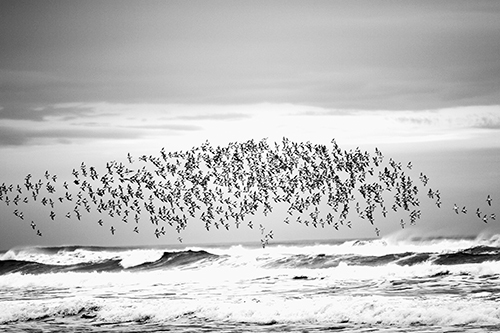 Along the Washington Coast, we watched the same flock of sea birds fly back and forth over the surf. They would reverse direction “on a dime” for no apparent reason that I could detect, although it probably made perfect sense to them. These happened to be going south and the other one in this category which could make a pair, were the same birds but flying north. When they flew north, they showed their dark backs and when going south, they showed their light bellies. I made both images with a Canon 20D digital camera and 70-200 f2.8 “L” lens just after getting off the Alaska Ferry in Bellingham, Washington as we were moving out of Alaska after 30 years in Fairbanks.